The caw is the most useful of all domestic animals. It is very gentle in nature. We keep her in our house. She is not a wild animal. It is a four footed animal. It has two ears, two eyes, two horns and a long tail. Its body is covered with soft and short hair. 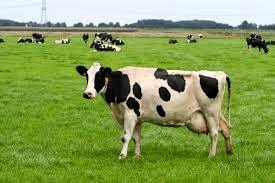 Cows are of different colours, such as red black, white etc. The cow is found all over the world.The cow lives on grass, straw, bran, oil cake, etc. The cow is very useful to us. It gives us milk. Milk is an ideal food. Butter ghee, chana, curd are made from milk. The bullock draws ploughs and carts. Cowdung is very useful to us.Bags, shoes, buttons, combs, salts and other useful things are made from her skin, bones and horns. We must take care of our cows.